Ningbo Comfort Furniture & Bedding Co.,ltd. Adjustable Bed is designed to conform to your body structure, relieving muscle strain, particularly in your neck, back, midsection, hips, legs and calves. Nervous tension is reduced. The pain of sore, aching muscles and joints is temporarily relieved. Common backache is eased. 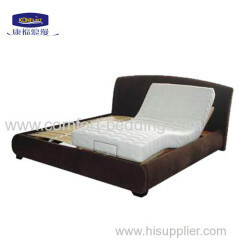 The quality of Adjustable Bed promotes deep restful sleep, without drugs!